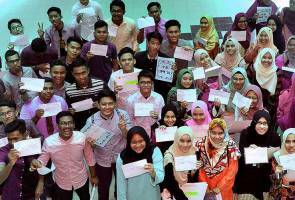 KUALA LUMPUR: A total of 1,129 of the 7,370 students in the Mara Junior Science Colleges (MRSM) obtained 9As in all subjects in the 2016 Sijil Pelajaran Malaysia (SPM) examination. This was 15.31 percent of the total number of students, compared to 14.69 percent in 2015. "Once again, the MRSMs have achieved excellent results, with all 48 MRSMs attaining the same performance as before, with 100 percent passes," Rural and Regional Development Minister Datuk Seri Ismail Sabri Yaakob said in a statement Thursday. He said compared to the 2015 results, the highest increase in performance was in English Language (0.34 percent), followed by Pendidikan Islam and elective subjects like Biology, Visual Art and Pendidikan Al-Quran dan Al-Sunnah.